President’s Message: What Will the Next President’s Nuclear Policies Be? The presidential candidates’ debates will soon occur, and the voters must know where the candidates stand on protecting the United States against catastrophic nuclear attacks. While debating foreign policy and national security issues, the Democratic and Republican candidates could reach an apparent agreement about the greatest threat facing the United States, similar to what happened on September 30, 2004. During that first debate between then President George W. Bush and then Senator John Kerry (now Secretary of State), they appeared to agree when posed the question: ”What is the single most serious threat to the national security to the United States?” Kerry replied, “Nuclear proliferation. Nuclear proliferation.” He went on to critique what he perceived as the Bush administration’s slow rate of securing hundreds of tons of nuclear material in the former Soviet Union. When Bush’s turn came, he said, “First of all, I agree with my opponent that the biggest threat facing this country is weapons of mass destruction in the hands of a terrorist network. And that’s why proliferation is one of the centerpieces of a multi-prong strategy to make the country safer.” President Bush also mentioned that his administration had devoted considerable resources toward securing nuclear materials in the former Soviet Union and elsewhere. Despite this stated agreement, the two candidates disagreed considerably on how to deal with nuclear threats. Today, the leading Democratic and Republican candidates appear to be in even further disagreement on this issue than Bush and Kerry, while nuclear dangers arguably look even more dangerous. I will not analyze each candidate’s views, especially because their views could change between the time of writing this president’s message in late June and the start of the debates in September. I think it is more useful here to outline several of the major themes on nuclear policy that should be addressed in the campaign and during the debates. The most fundamental theme is: what is the role or roles of U.S. nuclear weapons? Deterrence is the easy answer, but against what or whom? That is, should nuclear weapons only be used when another nuclear-armed state uses them against the United States or U.S. allies or should the mission be expanded to include deterrence against massive biological attacks, for instance? Assuming the next president wants his policy team to elucidate that the sole purpose of nuclear weapons is solely for deterring others’ use of nuclear weapons, the next question is: should the United States have a no-first-use policy of not launching nuclear weapons before others launch nuclear weapons? Such a policy would emphasize having nuclear weapons that would be secure against a nuclear attack that would come first from an enemy. For example, deployed submarines underneath the surface of the oceans would provide this type of secure force, whereas land-based nuclear-armed missiles and bombers could be more vulnerable to an incoming attack. Would the next president want to reduce the nuclear triad to a single leg of ballistic missile submarines? This decision would require considerable political courage and would have to withstand opposition from proponents who would want to keep the Air Force’s legs of the triad of intercontinental ballistic missiles and strategic bombers. However, the Air Force could transform its nuclear forces to have solely conventionally-armed missiles and bombers and in effect, it could have more militarily usable weapons that would not have to cross the high threshold of nuclear use. Another argument for shifting to having just submarines deploy nuclear weapons is the cost savings from having to maintain nuclear arms for land-based missiles and bombers. This leads to the debate topic of whether the United States should spend up to $1 trillion in the coming decades on “modernizing” its nuclear forces. All three legs of the triad are showing their age. Each leg will require $100 billion or more to upgrade the launching platforms of missiles, bombers, and submarines, and in addition, there would be several $100 billion more in refurbishing and maintaining the half dozen types of nuclear warheads plus the related infrastructure costs. Would a presidential candidate seize the opportunity to save hundreds of billions of dollars by smartly downsizing U.S. nuclear forces? The candidates would have to confront the promises made by the Obama administration to key Republican senators to “modernization” of the nuclear arsenal. This commitment was a crucial part of the bargain to convince enough Republican senators to vote in favor of the New START agreement with Russia in 2010. On June 17, 2016, Senator John McCain (R-Arizona) and Senator Bob Corker (R-Tennessee) sent a letter to President Obama to remind him of this commitment. Senator Dianne Feinstein (D-CA) and former Under Secretary of State Ellen Tauscher have called for Congress not to fund the proposed nuclear-armed cruise missile, known as the Long Range Standoff Weapon (LRSO), because: there is no compelling military need; it could lower the threshold of nuclear use; and it is too costly at an estimate of up to $30 billion. New START was a relatively modest reduction in strategic nuclear forces. The tough challenge for the next president is whether further reductions with Russia are even possible given the heightened tensions over Ukraine and other sticking points between Russia and NATO, as well as between Russia and the United States. Going much lower in numbers of strategic nuclear arms might require a rethinking of the nuclear weapons configurations in both nuclear superpowers. Thus, the next president will need a highly capable team who will understand U.S.-Russia relations, the concerns of certain NATO allies, the concerns of East Asian allies, namely Japan and South Korea, as well as the effect on China. China has remained apart from nuclear arms reductions, although Chinese leaders have made their views clear that they want to ensure that China has a secure nuclear deterrent. While China has for decades been content to have a relatively small nuclear force, there have been signs in recent years of a buildup and modernization of Chinese nuclear weapons and associated delivery platforms, particularly the ballistic missile submarines that have recently demonstrated (after years of technical setbacks) the capability to deploy further out to sea and within striking range of the United States. The next president will have to wrestle with a host of political and military challenges from China, and in the nuclear area, he or she will have to determine how best to deter China without having China further buildup its nuclear arms. A major issue of concern to China is the potential buildup of U.S. missile defense beyond just a relatively small number of missile interceptors. The ostensible purpose of this very limited U.S. missile defense system is to counter North Korean missiles and Iranian missiles, which are still relatively few in number in terms of longer range missiles. China has been concerned that even a limited or “small” missile defense system could threaten China’s capability to launch a retaliatory nuclear attack against the United States. In recent weeks, some senators have opened up a debate about whether to remove the word “limited” in the Missile Defense Authorization Act. In particular, Senator Tom Cotton (R-Arkansas) and Senator Kelly Ayotte (R-NH) have taken such action in the Senate Armed Services Committee, while Senator Edward Markey (D-Mass.) has sought to restore the word “limited.” Over the past 20 years, the debate in Congress has shifted, such that there is really no debate about whether the United States should have some strategic missile defense system; instead the debate has been about how much the United States should spend on a limited system and how limited it should be. The next president has an opportunity to renew this debate on first principles: that is, whether a strategic missile system provides some crisis stability, whether this system would impede further nuclear arms reductions, and whether this system could achieve adequate technical effectiveness. I will save (until a future president’s message) the challenges of Iran and North Korea. For this message, I will close by noting that both the George W. Bush administration and the Barack Obama administration made significant progress in securing and reducing nuclear materials that could be vulnerable to theft by terrorists. Preventing nuclear terrorism is very much a bipartisan issue, as is reducing any and all nuclear dangers. How will the next president build on the tremendous legacies of the two previous presidents in keeping the world’s leaders focused on achieving much better security over nuclear materials? Should the Nuclear Security Summit process be continued? What other cooperative international mechanisms can and should be implemented? As the leader of the world’s superpower, the next president must lead and must cooperate with other leaders in the shared endeavor of making the world safer against nuclear threats. As citizens, let’s encourage the candidates to debate seriously these issues and provide practical plans for reducing nuclear dangers. I am grateful to all the supporters of FAS and readers of the PIR. The special nature of nuclear energy requires particular safety and security conditions and stronger protective measures. The International Atomic Energy Agency (IAEA), as do other international and regional organizations, provides assessment, but it does not know a great deal about the security status of most Member States. It is necessary to learn of and determine the needs and concerns of a State for improving legal framework, reviewing detection of and response to illicit trafficking, and in order to develop a strategic plan that will enhance work that results in tangible improvements of security. Nuclear law has an international dimension because the risks of nuclear materials do not respect borders. Terrorist acts defy the law; they don’t belong to a State. The possibility of transboundary impacts requires harmonization of policies, programs, and legislation. Several international legal instruments have been adopted in order to codify obligations of States in various fields, which can limit national legislation. There are legal and governmental responsibilities regarding the safe use of radiation sources, radiation protection, the safe management of radioactive waste, and the transportation of radioactive material. The terrorist attacks of 11 September 2001 represented a clear challenge, but they must not stand as obstacles in the development of nuclear technology. It is necessary to reinforce these efforts in order to improve nuclear energy security, because energy is a vital issue that cannot wait. In its quest to secure Congressional approval for a new nuclear cruise missile, the Pentagon is putting words in the mouth of President Barack Obama and spinning and overstating requirements and virtues of the weapon. Hans Kristensen, director of the Nuclear Information Project, discusses these false claims and the potential ramifications they could have for the LRSO program. The full post can be viewed here: /blogs/security/2016/05/hiroshima-stockpile/. A directive signed by the Director of National Intelligence formally authorizes the use of social media by official investigators who are conducting background investigations for security clearances. The directive was crafted to avoid undue infringements on privacy. Investigators will be limited to considering only publicly available postings. The subjects of a background investigation “shall not be requested or required” to provide passwords for access to non-publicly available materials or to make such materials available; agencies will not be allowed to “friend” an individual for the purposes of gaining access to materials that are not otherwise available; and the consideration of social media must be relevant to the official guidelines for granting access to classified information – that is, they must pertain to substance abuse, criminal conduct, foreign allegiance, or other such criteria. Read Aftergood’s analysis in full here: /blogs/secrecy/2016/05/social-media/. The growing prospect of the use of drones for commercial delivery purposes is considered in a new memorandum from the Congressional Research Service. “Can you prevent a drone from flying over your house to deliver a package to your neighbor? Until now, that question has been of purely theoretical interest. However, the Senate recently passed a bill that could significantly change the operational landscape for unmanned aircraft systems (UAS or drones) and make these kinds of hypothetical delivery drones a reality,” the CRS memo begins. Read Aftergood’s take on the debate here: /blogs/secrecy/2016/05/delivery-drones-crs/. FAS Visiting Scientist, Dr. David Hafemeister, has just released his new book, Nuclear Proliferation and Terrorism in the Post-9/11 World (Springer 2016), a unique textbook tailored for undergraduate courses on nuclear proliferation and nuclear weapon issues and policy. Read a synopsis of the book, plus an exclusive interview with the author here: https://fas.org/wp-content/uploads/2016/05/booksynopsisinterviewdh_final.pdf. The Obama Administration has famously prosecuted more individuals for unauthorized disclosures of classified information to the media than all of its predecessors combined. But behind the scenes, it appears to have sought administrative penalties for leaks — rather than criminal ones — with equal or greater vigor. “This Administration has been historically active in pursuing prosecution of leakers, and the Intelligence Community fully supports this effort,” said ODNI General Counsel Robert S. Litt in testimony from a closed hearing of the Senate Intelligence Committee in 2012 that was released last week in response to a Freedom of Information Act request. But, he said, “prosecution of unauthorized disclosure cases is often beset with complications, including difficult problems of identifying the leaker, the potential for confirming or revealing even more classified information in a public trial, and graymail by the defense.” Read Aftergood’s analysis in full here: /blogs/secrecy/2016/05/administrative-penalties/. In light of the 30th Anniversary of the cataclysmic accident at the Chernobyl Nuclear Power Plant, Edward Friedman, Professor Emeritus of Technology Management at Stevens Institute of Technology, takes the opportunity to explore the meaningful lessons learned from that pivotal day in history. Read the full article here: /oped/chernobyl-after-30/. Leading experts came together to discuss Chernobyl on the eve of its 30th anniversary, the lessons learned, and possible implications that this fateful event has for the nuclear industry today. This special event was convened by the Federation of American Scientists. Speaker presentations and a full recording of the event are available here: /event/chernobyl-30-year-anniversary-event/. In this op-ed, Tara Drozdenko, Managing Director for Nuclear Policy and Nonproliferation at the Outrider Foundation, examines the science behind the catastrophic accident that occurred on April 26, 1986 at the Chernobyl Nuclear Power Plant in Pripyat, Ukraine, and discusses the lessons learned from that fateful day. Read the full piece here: /oped/what-happened-at-chernobyl-30-years-ago/. In the latest FAS Nuclear Notebook published in the Bulletin of the Atomic Scientists, Norris and Kristensen take the pulse on Russia’s nuclear arsenal, reviewing its strategic modernization programs and the status of its non-strategic nuclear forces. Russia’s non-strategic nuclear forces are currently the subject of much interest in NATO due to concerns that Russian military strategy has been lowering the threshold for when nuclear weapons could potentially be used. Russia has also been increasing operations and exercises with nuclear-capable forces, a trend that can also be seen in NATO and U.S. military posturing. The complete report can be viewed here: /blogs/security/2016/04/russian-nuclear-forces-2016/. From its inception 70 years ago, the founders and members of the Federation of American Scientists were reinventing themselves. Imagine yourself as a 26-year old chemist having participated in building the first atomic bombs. You may have joined because your graduate school adviser was going to Los Alamos and encouraged you to come. You may also have decided to take part in the Manhattan Project because you believed it was your patriotic duty to help America acquire the bomb before Nazi Germany did. And even when Hitler and the Nazis were defeated in May 1945, you continued your work on the bomb because the war with Japan was still raging in the Pacific. Moreover, by then, you may have felt like Dr. J. Robert Oppenheimer, the Scientific Director, that the project was “technically sweet”—you had to see it through to the end. But when the end came—the atomic bombings of Hiroshima and Nagasaki—in August 1945, you may have had doubts about whether you should have built the bombs, or you may have at least been deeply concerned about the future of humanity in facing the threat of nuclear destruction. What should you then do? About a thousand of the “atomic scientists” throughout the country at various sites, such as Los Alamos, Oak Ridge, Hanford, and Chicago began to organize and discuss the implications of this new military technology. Fortunately, these scientists persisted and achieved the notable result of successfully lobbying for civilian control of the AEC. While they also wanted international control of nuclear energy, they fell short of that goal. However, they were indefatigable in their educational efforts on promoting peaceful uses of nuclear energy and warning about the dangers of nuclear arms races. Throughout FAS’s seven decades, the organization has transformed itself into various incarnations depending on the issues to be addressed and the resources available for operating FAS. To learn about this continual reinvention, I invite you to read all the articles in this special edition of the Public Interest Report. This edition has an all-star list of writers—many of whom have served in leadership roles at FAS and others who have deep, scholarly knowledge of FAS. These authors discuss many of the accomplishments of FAS, but they also do not shy away from mentioning several of the challenges faced by FAS. What will FAS achieve and what adversities will occur in the next 70 years? As scientists know, research results are difficult, if not impossible, to predict. However, we do know that the mission of FAS is as relevant as ever, perhaps even more so than it was 70 years ago. Nuclear dangers—the founding call to action—have become more complex; instead of one nuclear weapon state in 1945, there are now nine countries with nuclear arms. Instead of a few nuclear reactors in 1945, today there are more than 400 power reactors in 31 countries and more than 100 research reactors in a few dozen countries. Moreover, some non-nuclear weapon states have acquired or want to acquire uranium enrichment or reprocessing facilities that can further sow the seeds of future proliferation of nuclear weapons programs. For these dangers alone, FAS has the important purpose to serve as a voice for scientists, engineers, and policy experts working together to develop practical means to reduce nuclear risks. FAS has also served and will continue to serve as a platform for innovative projects that shine spotlights on government policies that work and don’t work and how to improve these policies. In particular, for a quarter century, the Government Secrecy Project, directed by Steve Aftergood, has worked to reduce the scope of official secrecy and to promote public access to national security information. 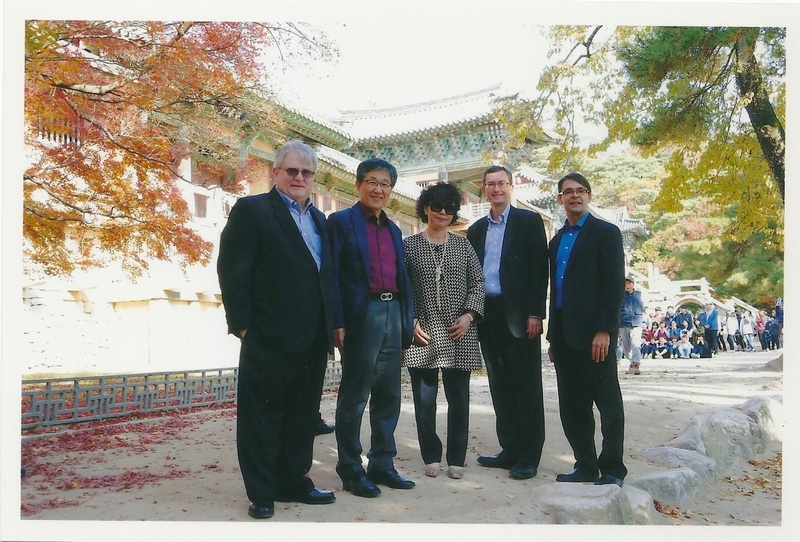 Nuclear energy research travel (cosponsored by FAS) to the Republic of Korea, November 7, 2013, taken at Gyeongju National Museum: From left to right: Paul Dickman, Argonne National Laboratory, Lee Kwang-seok, Korea Atomic Energy Research Institute, Florence Lowe-Lee, Global America Business Institute, Everett Redmond, Nuclear Energy Institute, and Charles D. Ferguson, FAS. FAS has also contributed to the public debate on bio-safety and bio-security. Daniel Singer (one of the contributors to this issue) and Dr. Maxine Singer have been active for more than 50 years in bio-ethics. Dr. Barbara Hatch Rosenberg and Dorothy Preslar in the 1990s and early 2000s worked through FAS to develop methods (such as an email list serve, which was cutting edge in the 1990s) to connect biologists and public health experts around the globe to identify, monitor, and evaluate emerging diseases. In recent years, Chris Bidwell, Senior Fellow for Law and Nonproliferation Policy, has led projects examining potential biological attacks or outbreaks and the forensic evidence needed for a court of law or government decision making in countries in the Middle East and North Africa. The Nuclear Information Project, directed by Hans Kristensen, continues its longstanding work on providing the public with reliable information and analysis on the status and trends of global nuclear weapons arsenals. Its famed Nuclear Notebook, co-authored by Kristensen and Robert S. Norris, a senior fellow at FAS, is one of the most widely referenced sources for consistent data about the status of the world’s nuclear weapons. I believe the greatest renewal and reinvention of FAS has been emerging in the past three years with the creation of networks of experts to work together to prevent threats from becoming global catastrophes. FAS has organized task forces that have provided practical guidance to policy makers about the implementation of the agreement on Iran’s nuclear program and that have examined the benefits and risks of the use of highly enriched uranium in naval nuclear propulsion. As I look to the next 70 years, I foresee numerous opportunities for FAS to seize by being the bridge between the technical and policy communities. I am very grateful for the support of FAS’s members and donors and encourage you to invite your friends and colleagues to join FAS. Happy 70th anniversary! Alice Kimball Smith, A Peril and a Hope: The Scientists’ Movement in America 1945-47 (Cambridge, Massachusetts, The MIT Press, 1971). Richard G. Hewlett and Oscar E. Anderson, Jr., The New World, 1939/1946: Volume I, A History of the United States Atomic Energy Commission (The Pennsylvania State University Press, 1962), p. 448.